Bay Creek includes 8,000' of Chesapeake Bay shoreline between Plantation Creek and Cape Charles Harbor, and another 2,500' north of the Harbor to King's Creek Inlet. In the southern section, active erosion was threatening to connect a fresh water pond to the bay and damage portions of the Arnold Palmer golf course. In the northern section, active erosion was consuming prime residential lots. Offshore breakwaters are designed to intercept a portion of the wave field and create zones of low energy in the lee of the breakwaters. These low energy zones allow sand to settle out and be retained on the beach. 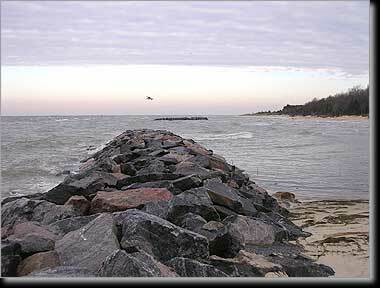 Offshore breakwaters are typically segmented to protect a long beach at an efficient cost. The beach behind segmented breakwaters becomes curved, with the beach immediately behind the breakwaters extending towards the breakwater and the beach behind the gaps receding towards the land. The objective is to design segmented breakwaters to stabilize the beach in a curvilinear shape with tombolos of sand. Regulatory permits were obtained with special conditions to protect the Tiger Beetle habitat and several SAV beds. Nine segmented breakwaters were constructed with beach fill to protect the southern section, and seven segmented breakwaters and beach fill were constructed to protect the northern section.